Real estate professionals must be motivated; this starts with the licensing process. Education and licensing are generally self-paced, which means you can complete the coursework as you have time. Depending on the school, the courses you choose and your determination to get licensed, it can take a matter of weeks, months or years to obtain a real estate license. Getting any real estate license entails coursework, exams, fees and continuing education. You may also have to pass a criminal background check, which involves fingerprinting. Each state and license-type has unique requirements. A web search using keywords "real estate licensing" and the name of the desired state yields the state's real estate governing board's official website. Real estate governing boards go by a variety of names. For example, in California, the real estate authority responsible for licensure is the California Bureau of Real Estate, formerly known as the California Department of Real Estate. In New York, it's the New York State Board of Real Estate. Licensing fees vary widely by state and program, as do the scope of courses and exams. You can find real estate courses at universities, community colleges, through certain real estate companies or for-profit real estate schools. Education may be completed in the classroom or online. Most states require 30 to 90 hours of coursework for a salesperson's license. You must pass the pre-licensing coursework to sit for the licensing exam. The licensing exam covers state-based material, such as ways of holding title, and federal topics, such as fair housing laws. You must pass the licensing exam within a specified time frame once you successfully complete a pre-licensing course. If you don't achieve a passing score, you can take the licensing exam several times within a certain window of time, which varies by state. Once you pass the licensing exam, you must obtain a real estate license within a limited amount of time. In some states, new salesperson licensees must work under a broker's sponsor. Broker sponsorship helps new agents avoid engaging in risky, unethical or unlawful activities when they begin to practice real estate. In certain states, you can join a broker-sponsor training program before obtaining your license. Continuing education allows you to maintain your real estate license for years to come. It also provides the latest information regarding rule changes and the laws affecting real estate practice and professionals. Schools that offer pre-licensing education usually offer continuing education for salespersons and brokers. Check with your real estate board to determine time frames for completing required continuing education courses. You can generally hold more than one real estate license throughout the country. Some states recognize out-of-state licenses and grant licenses to real estate professionals from certain states. This is known as reciprocity. For example, subject to background checks and a fee, Georgia accepts licensees from other states, waiving the education requirements for a Georgia real estate license. C., Karina. "How to Get a Real Estate License." 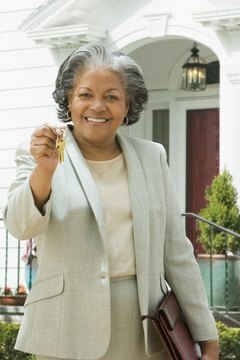 , https://careertrend.com/how-4852810-real-estate-license.html. 05 July 2017.